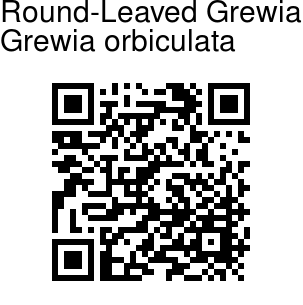 Round-Leaved Grewia is an unarmed shrub or a small tree, growing up to 4 m tall. Young branches are softly velvety. Leaves are broadly elliptic or obovate, obovate-oblong, nearly round or obovate, 3-8.5 x 2-5 cm, 5-nerved, with toothed margin. 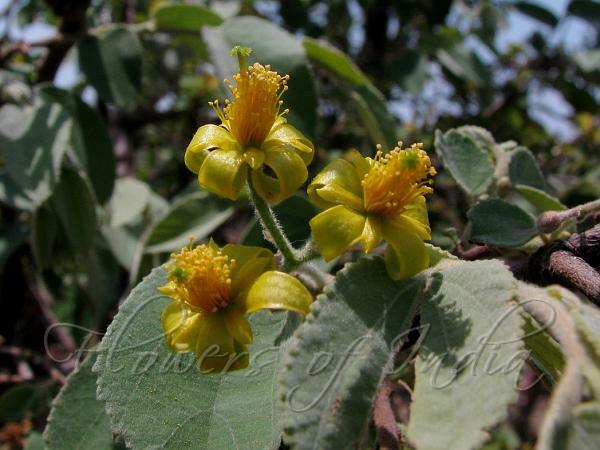 Leaves are velvety above, and the base is rounded. Stipules are lanceshaped, falling off. Yellow flowers are borne in umbel-like cymes. Fruit is round, obscurely 2-lobed, hairy. Flowering: March-July.